The Twitter account Weezer Cover Africa By Toto has long been urging the band to release their take on the classic 1982 hit. 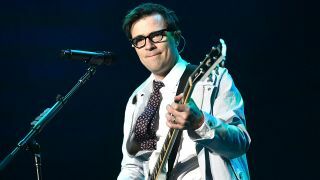 Now Rivers Cuomo and co. have finally shared their take on the song… but only after Weezer trolled the fan by first covering Toto’s Rosanna. And earlier today, when Weezer launched a stream of Africa, the fan account reacted: “I don’t know what’s next. Just let me enjoy this for a while. Weezer have yet to comment, simply adding a link to the cover over on Facebook. Listen to both Africa and Rosanna covers below. Weezer released their 11th studio album Pacific Daydream last year via Atlantic Records and will tour across North America throughout the summer.